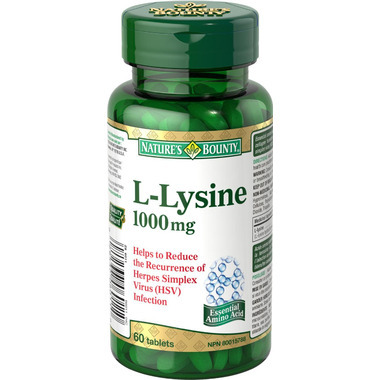 L-Lysine is an essential amino acid that cannot be made by your body, but rather comes solely from nutritional sources. Nature's Bounty L-Lysine helps to reduce the recurrence of cold sores. Adult Dosage (Oral): Take 1 tablet, one to three times daily. Consult a health care practitioner for use beyond 6 months. Non-Medical Ingredients: Microcrystalline Cellulose, Croscarmellose Sodium, Silica, Magnesium Stearate, Purified Water, Hypromellose, Maltodextrin, Triacetin, Polysorbate 80, Titanium Dioxide. Heard about this online, had used the Lysine lip salve so I thought I would try. Taking the pills at the first sign of a cold sore seems to stop most of the symptoms. I will buy again! !